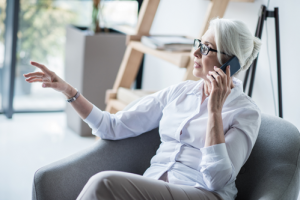 Your Hearing Healthcare Provider will ask you a lot of questions about what communication requirements you have, and they may ask you if you want a hearing aid with Bluetooth. But just what is Bluetooth and how can it assist you to reach your hearing goals? Bluetooth is a way of allowing the sharing of signals between various electronic gadgets without any cords. It’s a great way for connecting small devices to other nearby electronic devices. Bluetooth is part of wireless technology boom (think radio waves), which is connecting us all in ways we now take for granted, or don’t even realise it is happening. Cordless phones, wireless internet, television and radio receivers all use wireless technology. Bluetooth is like this wireless technology but it is designed for communication between devices over a shorter distance – usually less than 10 metres. A good example of devices that use Bluetooth connectivity would be your mobile phone in the car (allowing for hands-free conversations), or perhaps a wireless mouse set up with your laptop, or maybe you download photos from your camera to your computer via Bluetooth. Working across high frequency channels (centred around 2.45GHz) Bluetooth enabled devices send radio waves to connect with each other. You can have up to 8 devices connected at once, with each pair of devices using one of the 79 channels. Don’t worry about connecting to something you didn’t ask for! One Bluetooth device needs to be ‘paired’ with another device to enable them to ‘talk to each other’ or transmit data. One of Bluetooth’s best features is that has a low power consumption, but it does have a large drain on battery-operated devices (such as hearing aids). However Bluetooth technology, like everything else, is constantly improving and battery drain will hopefully be a thing of the past in the not too distant future. Bluetooth is also a fairly secure method of transmission. This is because paired devices constantly shift the frequency they are using – not just once or twice, but thousands of time a second – amazing! You can now buy hearing aids that have Bluetooth connectivity. Hearing aids now have the capability to connect to your phone, TV, music players and a myriad of other devices. Bluetooth enabled hearing aids can now stream these signals direct to your hearing aids. There are made for iPhone devices and devices that have universal connectivity or ‘made for all’ streaming. Made for iPhone hearing aids (Oticon Opn, Starkey Halo iQ, Widex Beyond Fusion 2) will pair directly with your Apple device – your Hearing Healthcare Provider can show you how to do this. If you don’t have an iPhone you can use a small hearing aid accessory which will connect with your devices and stream the sound directly to your hearing aids. This accessory is required to convert the Bluetooth signal to an FM signal for your hearing aid. Universal Connectivity (Phonak Marvel, Starkey Livio AI) or Made for All (Hansaton sound SHD stream, Unitron Moxi All, Resound LiNX Quatrro) hearing aids will allow streaming through any smartphone. 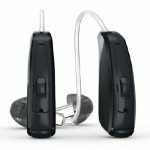 Starkey was the first company to introduce Bluetooth connectivity with their hearing aids. This device will allow all kinds of streaming through the TruLink app from your iPhone. It will stream calls into both ears. You can also control volume, listening environment and the program you are in from the TruLink app. The LiNX 3D also connects directly with iPhone. You can connect with Android through the ReSound Phone Clip and this will allow direct binaural streaming from android phones for calls and audio. You can adjust your hearing aid volume or program for phone calls. 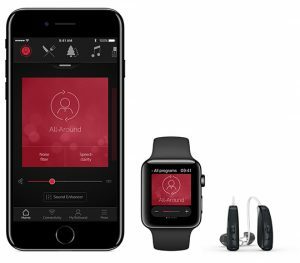 The other feature with the ReSound LiNX 3D is that it can be remotely adjusted by your Hearing HealthCare Professional through the ReSound Smart 3D app. 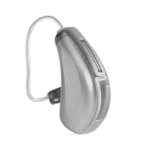 Oticon uses 2.4 GHz Bluetooth low energy technology with its Opn hearing aid. It has direct iPhone Android phone compatibility with the Opn Connect Clip. It streams to both ears. It utilises a wide audio streaming frequency range (7.5 kHz), giving high quality sound. The Opn has low battery consumption. Made for iPhone with low power consumption, the Beyond Fusion 2 allows full streaming functionality and control over your listening environment for Apple products. For Android users the DEX connectivity accessories will allow Bluetooth streaming. This hearing aid is made for any smartphone which is fantastic for Android phone users. Your phone can be up to 10 metres away for you to answer or reject phone calls by the touch of a button on your hearing aid. However it only streams phone calls into one ear, and you need an intermediary device to stream music or other media from your phone. You will be able to stream TV directly to your aids but you need a connectivity box (as with all TV streaming from any hearing aid). 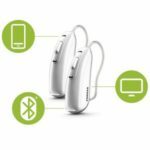 This new release from Phonak ensures connectivity to any mobile phone as it uses Bluetooth Classic technology so will connect to any device that has Bluetooth. This one is a step up from the Audeo-B Direct as it streams audio in to both ears with phone calls. It will also streams all audio, no matter whether its voice, music, audiobooks or TV (through TV connector) to both ears. Coming in 2019, the Bluetooth connectivity available through the Livio AI gives the user a number of features including: binaural streaming from any phone; remote programming by your Hearing Healthcare Professional; using the Thrive Hearing app you can change your listening experience in whatever environment you are in; set up a microphone on your smartphone and you can stream your conversations directly to your hearing aid; receive notifications of phone calls, texts and emails; and with an iPhone, Siri will read your texts and emails directly to your hearing aids. If you have internet connection you can use the Language Translation Easily communication tool and stream a conversation with people who speak other languages. Apart from clear sound direct to your hearing aids without background noise, one of the main benefits of Bluetooth is that you can control your hearing aids through your phone. You don’t have to worry about fiddling with controls you can’t see – just use your phone! You will have to download the appropriate hearing aid app on to your smartphone. Depending on what brand you buy, you will need a specific app for the hearing aid you purchase. Once you have the app installed on your phone you can adjust your hearing aid volume, program and, for some brands, your particular listening environment. Some apps will even connect directly with your Hearing Healthcare Provider and they can adjust your hearing aid remotely! Some apps will also track your hearing aid if you happen to misplace them – a very useful inclusion. Bluetooth technology is always improving and with the release of Bluetooth 4.0 technology in hearing aids, they now have a lesser drain on battery power. This means better sound and longer streaming time. Bluetooth features in hearing aids are now commonplace and you don’t have to pay more for them. 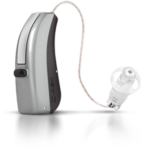 Hearing Choices’ hearing aid prices are up to 40% cheaper than the large retail clinics. Prices for basic level hearing aids start from around $1,300, mid-level from $2,450 to $3,000 and advanced or premium level hearing aids from $3,000 to $4,000. If your hearing aid doesn’t stream directly from your phone, you can still purchase a relatively inexpensive accessory to enable wireless streaming from all your favourite devices. Want more information about bluetooth hearing aids?